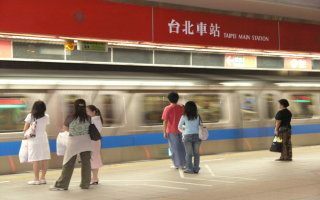 In the interest of promoting tourism, the Taipei Rapid Transit Corporation will be adding Japanese to the station arrival alert at a number of MRT stations frequented by Japanese tourists starting August 10. The station name pronounced in Japanese will be added to the broadcast when the train approaches the respective stations. The arrival alert currently includes the station name pronounced in Mandarin, English, Taiwanese, and Hakka. A total of 13 stations are on the list of stations with Japanese language alerts, with service to be implemented for tourist attractions such as MRT Shilin Station and MRT Taipei 101/World Trade Center Station. Over time, the Japanese language station arrival alert will be expanded to the other stations, including MRT Dongmen Station, MRT Tamsui Station, MRT Jiantan Station, MRT CKS Memorial Hall station, MRT Beitou Station, MRT Xinbeitou Station, MRT Zhongshan Station, MRT Taipei Main Station, MRT Ximen Station, and MRT Longshan Temple Station. According to statistics, the Greater Taipei Area attracted 3.4 million tourists from across Asia in 2017. Among these tourists, 1.5 million came from Japan, accounting for 47-percent of Asian visitors. TRTC noted that ticket vending machine currently offers interface in Chinese, English, Japanese, Korean, Malaysian, Thai, Vietnamese, Indonesian, German, French, and Italian.